4.Copy below code and paste it just before the ]]></b:skin> tag . 5.Now Scroll down to where you see </head> tag . 7.Now again Scroll down to where you see </body> tag . 8.Copy below code and paste it just before the </body> tag . 9.Now Click on "Save Templates". 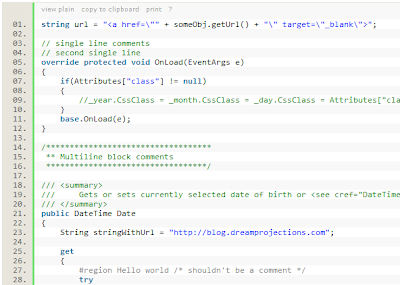 Place your code on the page and surround it with PRE tag. Set name attribute to code and class attribute to one of the language aliases you wish to use. but it puts extra line at the end of the code. for #include it add at the end.